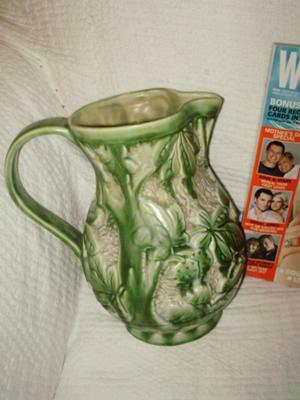 I found this Embossed Green Pottery Jug over 15 years ago in an antique shop near Wollongong, NSW, Australia. It is about 9 and a half inches tall and mainly green. It is covered in embossed green foliage with rabbits hopping through, 2 rabbits on one side and one on the other. Embossed 3D effect, with deep shaping of surface. Has “Made in England” and “676” on base. Interior is light grey and lemon tones, very mottled effect. I have looked and looked but never found another one, not even anything very similar. 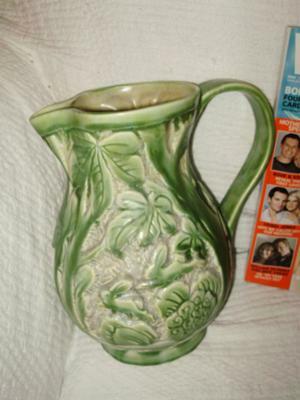 It has a smooth matte finish that makes you think of Beswick or Sylvac or Crown Devon, for example. I’d appreciate any help in identifying the maker. Hi, I too have EXACTELY the same jug with rabbits (or hares) jumping amongst tress and foliage. It’s 10″ tall from base to centre of pouring lip. I too cannot find out when it was made or how much it’s worth. Would be very grateful for any further information. Thanks for your information. Raspberry colouring sounds nice. The things people put in skips! You are obviously knowledgeable about Beswick. I’m pleased to know the name of the range and the year of manufacture. I cannot believe what good condition mine is in from almost 80 years ago. Someone must have really looked after it for the 60+ years before I bought it. This website has been a wonderful way to solve a mystery, thanks to people like you. I have the same Beswick ware jug but in raspberry colour. Someone had put it in a skip and a friend found it, knew I collected Beswick and gave it to me. I beleive it was made around 1936 and is the Modelle range. Dear Sue, Thanks so much for your response. I assume that mine somehow missed out on the Beswick mark and just got 676 and Made in England. I’ve had mine for over 15 years, and paid $32 for it without a maker’s name. How much did you pay for yours? I really love the size, shape and feel of this jug, as well as the rabbits. I use it a lot and it is one of my very favourite things. I hope that you enjoy yours as much! I’ve just bought one but in an ivory/sand coloured finish. 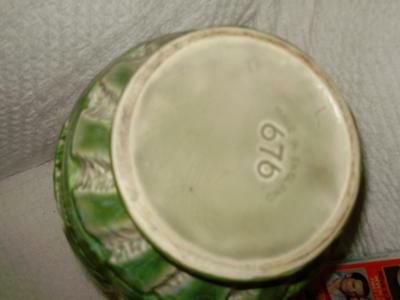 It’s clearly stamped with the Beswick Ware mark, as well as 676 and Made in England. I was looking for some info and found your query here! Hoorah! At last I have found out something about it. How do you know it is Beswick? I do have another Beswick item that has Beswick impressed on the bottom, but the glaze is so thick that the impression has almost filled up and the word “Beswick” is only readable when you get it at the right angle and in good light. I am wondering if this may have happened here, or perhaps it was only ever marked with the number and “Made in England”. I would really like to hear how yours is marked. I hope that you love yours as much as I do. It looks so nice with cut flowers such as lilac or hydrangeas and gives so much pleasure. Thank you so much for your help, and I will let you know of any other information that I might obtain.